All projects in receipt of European Structural Fundsi are required to publicise the fact that they have been assisted by a European Programme, this is a formal condition of grant. If this requirement is not met, funding can be withdrawn. There is sometimes confusion amongst project applicants as to how they should suitably address these requirements. The following brief guide should prove helpful. Information and publicity about assistance from the Structural Funds is intended to increase public awareness and transparency regarding the activities of the European Union and create a coherent picture across all Member States. The European Commission is extremely keen that beneficiaries, potential beneficiaries, economic and social partners and the wider general public are aware of any support received from European funds. The Commission’s guidelines which have to be adhered to by Member States are set out in Regulation (ECi) No 1159/2000 of 30 May 2000 entitled, ‘Information and publicity measures to be carried out by the Member States concerning assistance from the Structural Funds’. Although not always possible, the European Commission strongly encourages the use of the relevant logo on the actual title page of any piece of literature. It is also expected that support from European Structural Funds is verbally promoted to beneficiaries and to the wider community at external meetings, training events and at all other relevant platforms. The display of EUi promotional posters and the European Union flag is also encouraged. 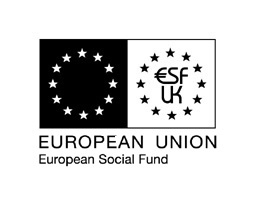 The new ESF UK logo was introduced at the start of the current programming period of 2000 – 2006. To download the logos, right click your mouse, select 'Save Picture As' and select a location to store the image. For those organisations currently using the ESF logo, please ensure that your version states, ‘European Union’ and not ‘European Community’. The wording on the logo has been updated. If you are using printed material which uses the ‘European Community’ strapline, do not panic as you can use up current stock and then revise the logo when you replenish stocks. Alternatively, the ESF logo can be downloaded from the website below. This website also features a comprehensive guide on how to correctly use the ESF logo, eg. colour reproduction, size variations, exclusion zones etc. It is recommended that this guide is consulted. If you are unable to download the logo, please contact the European Team at North West Network. The ERDF logo incorporates the European Union emblem itself with the wording as demonstrated. To download the logo, right click your mouse, select 'Save Picture As' and select a location to store the image. Contrary to common thinking, the most important thing to remember is to mention the European Union, it is ‘optional’ whether you mention ERDF or not. The wording can be placed underneath the logo as well, but not to the left or above. Please note that the use of the European emblem without the relative text is not sufficient. The official emblem of the European Union is an instantly recognisable and indeed powerful image. To download the logo, right click your mouse, select 'Save Picture As' and select a location to store the image. The European Commission welcomes the use of the European Union emblem. A frequent mistake is to use the emblem upside down. It is easy to check if it is the right way up by looking at the stars. If the stars have two points each pointing upwards, then the emblem is the wrong way up. Another mistake is to change the orientation of the stars. The circle is arranged so that the stars appear in the position of the hours on the face of a clock. The standard colours to be used are Pantone Reflex Blue and Pantone Yellow, reproduction in black and white is also accepted. Helping to reduce the gap between development levels and living standards among the regions and the extent to which least-favoured regions are lagging behind. Helping redress the main regional imbalances in the Community by participating in the development and structural adjustment of regions whose development is lagging behind and the economic and social conversion of regions. Helping develop employment by promoting employability, the business spirit and equal opportunities and investing in human resources. The Structural Funds aim to help to promote the development and structural adjustment of a region that has fallen behind other parts of the European Community. Please remember that abbreviations should not be used without the full names of the Fund. There is the additional requirement for permanent commemorative plaques to be placed at sites accessible to the general public which represent projects part-financed by the Structural Funds. Infrastructure projects whose total cost is more than Euro 3 million or more than Euro 500,000 (FIFG) are required to have plaques. The plaque must show the European emblem and wording reflecting the contribution from the European Union. It is optional to include the name of the Structural Fund although it is strongly encouraged. On contacting CDS the following code needs to be quoted in order to obtain the plaques and the fixing kits. It is worth noting that Objective 2i Action Plan Partnerships can provide further advice and guidance on ERDF publicity requirements and copies of the ERDF logo. To conclude - it’s easy to forget about publicity, especially when you’re concentrating on budgets and beneficiary numbers. However, if you have a project which has been part-funded by European Structural Funds, you will be monitored to see that you are complying with the Regulations. This will happen either through a claim and progress report, or if you are inspected by an auditor. If you have not promoted the European contribution, you may have to pay back some of the grant. The ESF Division’s Verification and Auditi Team carry out audit inspections to ESF funded projects and they themselves list, ‘Nil or inadequate publicity’ as one of their main areas of concern from previous audits. So, don’t forget, always build into your project budget an amount for publicity, don’t start promoting until full approval notification has been received and if in doubt, seek further guidance. If you require any further information, please contact the European Team at North West Network.